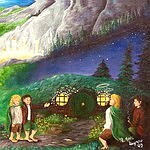 Tolkien created 'Moonlight on a Wood' in a spurt of artistic and literary creativity that burst forth in the late 1920's. 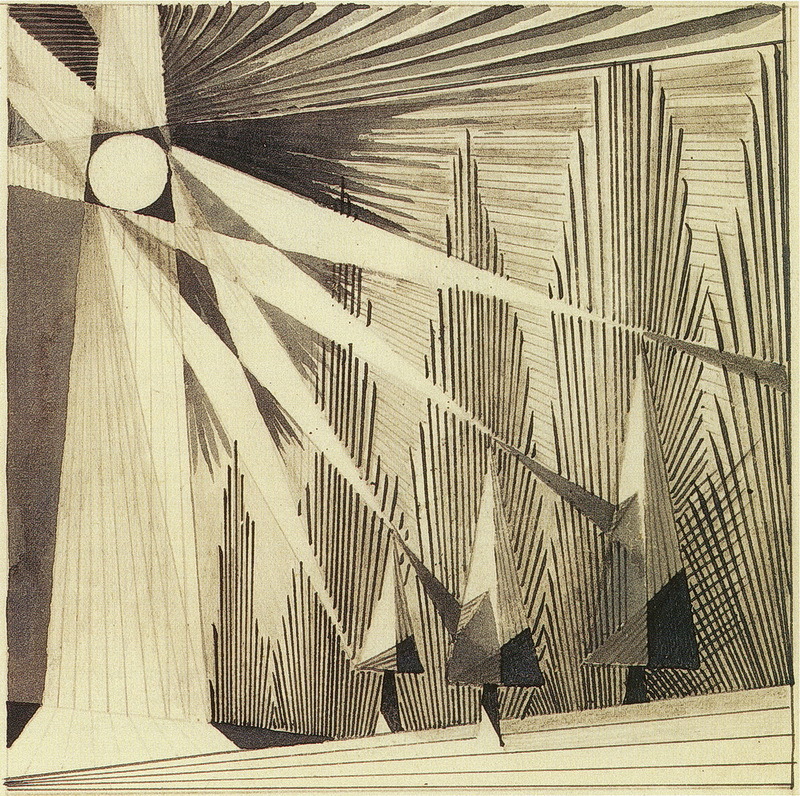 As was seen in the previous post, Tolkien long had been drawing from life. He also had been making imaginative, non-realistic pictures, particularly in 1913-15, which illustrated his expanding secondary world. But he made few pictures in the years that followed, and, after 1922, none at all. In 1927-28, however, his imagination exploded. His art work exploded along with his ideas for developing his secondary world. His style in illustration became more painterly, more confident, and, though he still favoured bright colours, more subtle. Perhaps the family holidays at Lyme-Regis in 1927-28 afforded him the opportunities he needed to express himself in art. 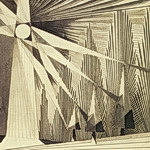 'Moonlight on a Wood' is a nearly unique piece in that Tolkien rendered the picture's trees in a Cubist manner. I don't know what Tolkien intended to convey though this experimentation in style, but I find the picture's angular starkness strongly evocative, beautiful but mysterious, chilly, eerie, even hallucinatory, as if I were a mortal entering the Perilous Realm. Jan-u-wine's poem responds to the picture's stark mystery in its own way, using words rather than brush strokes. She said of the uniqueness of the picture, "It really is a mesmerizing piece, isn't it? So weird and yet so.....wonderful. I really would like to have known what was in his mind. 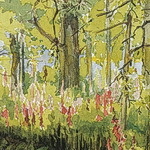 This is surely...jazz from a man who was always a classicist....."
~ "Foxglove Year" by jan-u-wine for watercolour of the same name by Tolkien. Lovely poem and interesting never seen before painting. Thank you, Linda, glad you enjoyed it! It was only after I had read Jan’s poem that I realized Tolkien had painted moonlight not just in any forest but in a pine forest. I love that early clue of “needles of scent” in the poem. Then, at the end, you realize that they are real pine needles on the forest floor and that the painting shows the structure of pine trees. Very interesting. I loved "needles of scent" too. It enhances all the sharp straight lines in the piece, the angled ones like lances, the verticals like racks or sprays of spears and arrows.